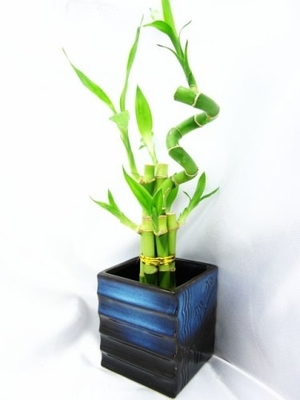 Lucky bamboo, botanically known as "Dracaena sanderana" Grows in water like cut flowers, but will last for years Our feng shui indoor house plants are imported from Taiwan with the best quality. We're selling one of this rare treasure! , The diameter of this plant is about 4 x 6"-8" , 2 x 8"-10" and 1 x 10"-12" tall. Ceramic Vase IS 3.5" IN LENGTH & 3.5 " WIDE & 4"IN HEIGHT. Please see the picture for the detail look for this Lucky Bamboo. Will include small amount of crystal soil to insurance you receive the top quality of the luck bamboo. We will ship with care instruction tag.